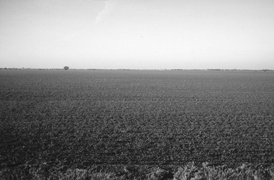 Kansas truly is flatter than a pancake, according to researchers from two other states who published their results in the Annals of Improbable Research (AIR) in August. Their findings have raised some Kansans hackles. 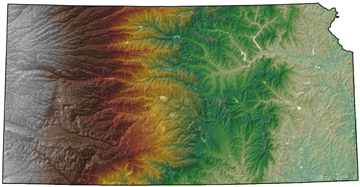 This digital elevation model shows Kansas gently sloping topography  some say, flatter than a pancake, according to new research. But is it so? Courtesy of the Kansas Geological Survey. 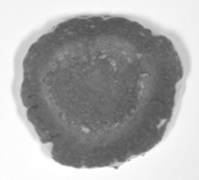 After a visit to the International House of Pancakes, geographers Mark Fonstad and William Pugatch of Texas State University-San Marcos and Brandon Vogt of Arizona State University in Tempe digitally scanned the surface of a pancake in cross-section. They then plugged the data into a computer model that determines flatness by comparing the pancakes rim to the best-fit polynomial line. By that measure, at the millimeter scale, the jagged edge was more rugged than the Grand Canyon, the team wrote. Kansas, however, was almost perfectly flat at the same vertical relief scale (with relation to its overall length), using the same methods on a digital elevation model of an east-west cross section of the state. Everything on Earth is flatter than the pancake as they measured it, says Lee Allison, head of the Kansas Geological Survey  including the Rocky Mountains, the Marianas Trench, Mt. Everest and the Tibetan Plateau. The team, Allison says, measured a pancake plateau that included the sides of the pancake. That extra height would be equivalent to about 70 miles of topographic relief in Kansas. To answer questions from descending news media (even the Los Angeles Times wrote an editorial on the findings), Allison and his survey co-workers used a simpler relief ratio that placed Kansas 23rd among all 50 states. The state slopes from a little over 4,000 feet elevation in the west to around 400 feet in its southeast corner. The flattest state is Delaware, says Allison, who has enjoyed the opportunity to discuss Kansas geology the ruckus has provided. The pancake and Kansas. Photos courtesy of the Annals of Improbable Research. Fonstad and his co-authors, in defense of their assessment, cited previous work in the Annals of Improbable Research (the publishers of which also present the Ig Nobel awards) that concluded comparing apples and oranges is not impossible. One of the conundrums in geography, Fonstad says, is trying to compare things that are not the same size, such as rivers or even riverbanks. The other side of the teams discovery, he says, is that a pancake is not as flat as Kansas if you look closely enough.